Have you heard the call to "give something back to the community"? Have you the time to donate to a worthwhile cause while actively serving your family, your neighbors, yourself? Have you ever thought about volunteering for an organization to learn new lifesaving skills or considered a move into the medical career field? Have you ever witnessed an emergency situation and did not know what to do? Has the thought of assisting a neighbor in their time of need pulled at you? We have provided many individuals with medical training that has been used to help family, friends and neighbors. Active membership in a volunteer ambulance setting is often a footstep to gain experience that many hospitals, ambulance corps, and other Allied Health related fields desire. Alumni from LVA have enjoyed diverse careers in Medicine. Ranging from Occupational Therapy to Respiratory Therapy. From Phlebotemy to Nursing. From Laboratory work to Pharmacy. The possibilities are endless. Volunteer membership opportunities include: Drivers, Medics, Base Officers and Auxillary/ Social Memberships. No experience is necessary. We provide all training and will partner you with an expericenced and concerned mentor. Training evolves into clearance when your mentor is satisified that you have met all of the requirements. Most importantly, when YOU feel ready with your experience, then you become a provider on our team. Continuing training is offered through our Training Department, and is provided at no cost to you. Annual confrences and distance learning opportunities abound for the active member. If you wish more information, please contact one of the Operations Staff at (585) 768-8612. Or use the 'send me a message' link below. April 3, 2009.....I would invite any of our residents to contact me at lvadirector@yahoo.com with any concerns or issues. I know there are many concerns that have not been answered. Also, I have always believed there isn't enough communication with our residents. One question is: How will the new ambulance company, that takes over the County, interact with LVA. The ambulance corp that replaces the City Ambulance will have the same mutual aid structure. 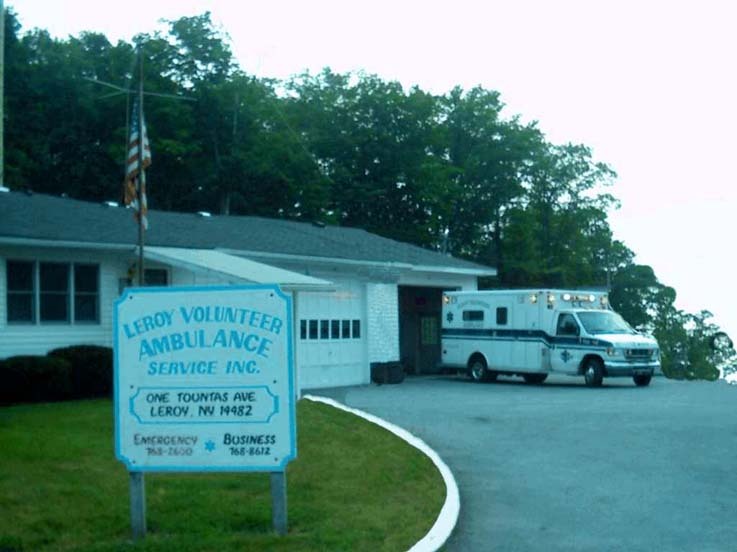 LeRoy Ambulance will still be the host provider for the Town and Village of LeRoy. The new company will assist LVA as mutual aid. Next question is: I don't see volunteer on the side of the ambulance anymore. Our ambulance crews are mostly comprised of paid personnel. We still have some volunteers that assist, however, that number has been severely reduced. The only way we can run 24/7 will be to have crews that are mostly paid staff. Promoting education and training opportunities for Le Roy, NY citizens as well as community members in our service area.